Pakistan failed to move forward with the purchase of eight U.S.-made F-16C/D Block-52 fighter aircraft following a dispute over financing, Dawn reported on May 28. According to an unidentified source Pakistan failed to provide a so-called Letter of Acceptance for the procurement of the eight fighter jets by May 24 and the offer expired. “Pakistan decided not to fully fund the case with national funds, so the terms of sale have now expired,” the source told Dawn. 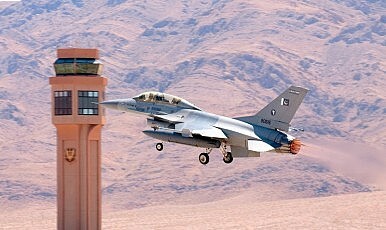 U.S. lawmakers have been blocking financing for the eight F-16s under the so-called Foreign Military Financing (FMF), with the result that Pakistan would have needed to pay $700 million instead of the original $270 million for the aircraft–a price increase of two-and-a-half times the original cost. U.S. lawmakers have repeated voiced their concerns that the fighter jets would not be used to fight insurgents within Pakistan but rather be deployed to deter India. It was only in February that the U.S. State Department approved the possible sale of the F-16 fighter jets to Pakistan with the Pentagon’s Defense Security Cooperation Agency (DSCA) notifying Congress. While Congress has approved the sale, key members have made clear that they object to using FMF (foreign military financing) to support it. Given Congressional objections, we have told the Pakistanis that they should put forward national funds for that purpose. As a result, Pakistan has repeatedly stated that it will consider purchasing Chinese or Russian aircraft instead, icluding Chinese-made Chengdu J-10 lightweight and J-20 stealth fighter aircraft, as well as Russian Sukhoi Su-35S multirole fighter jets. “However, it is even more unlikely that Pakistan will induct new fighter aircraft types such as the Chengdu J-10 or Sukhoi Su-35 into the PAF, given the logistical difficulties, extra maintenance cost, and additional training requirements that a new fighter aircraft acquisition would entail,” I noted on May 11. Pakistan has also been in talks with TUSAS Turkish Aerospace Industries (TAI) over upgrading 74 F-16 fighter aircraft currently in service with the Pakistan Air Force (PAF). TAI previously won a contract in 2009 to modernize 41 F-16 aircraft for the PAF, with the last improved fighter jets handed over to the PAF in September 2014. Any future Turkish-Pakistani deal is subject to U.S. approval. US Won't Subsidize Pakistan's Purchase of F-16 Fighter JetsWill US Congress Stonewall F-16 Sale to Pakistan? US Will Sell 8 F-16 Fighter Jets to Pakistan US-Pakistan F-16 Deal Is Dead: Islamabad Mulling Jordan F-16 Fighter Jets InsteadIs the US About to Sell 1,000 Missiles to Pakistan?